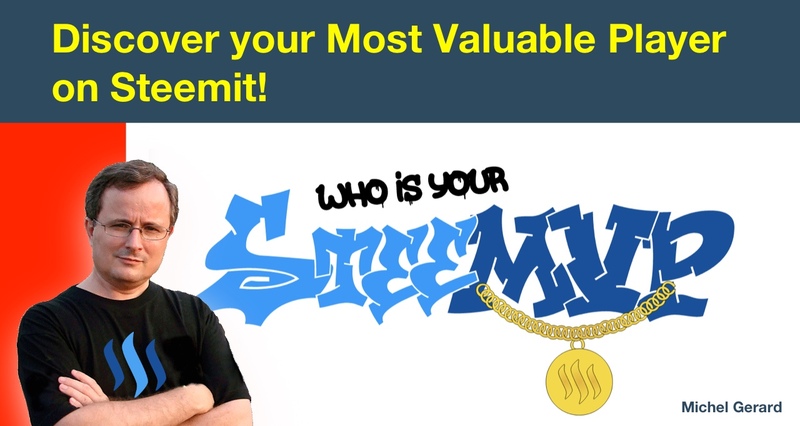 Discover your Most Valuable Player on Steemit! 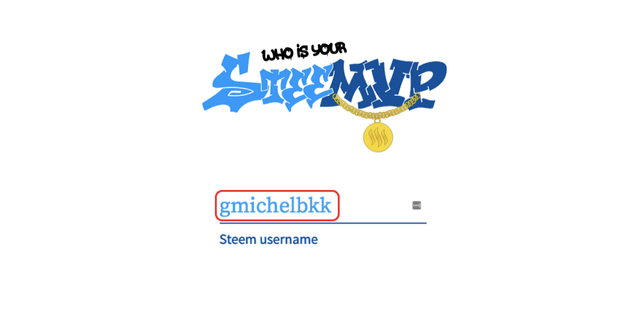 Would you like to know who is your most valuable player and most loyal player on Steemit because this information might be useful if you want to follow and upvote them back? The tool also shows your other valuable and loyal players that you will like to know about. This tool named "SteemVP" was created two years ago and is one of the oldest tool I know of, which was made by @roelandp. When you go to the website, it is all you see and you have to enter your username, and then hit your "Enter" key on your keyboard. Don't look for a "Submit button" because there is none. After a few seconds, you will see your results in a single page. The results are displayed with a unique and colorful font, which is very original for a tool like this. The tool will tell you how many votes you got from how many voters in the last 30 days. It will also show you the amount in payout value. You will find the tool most helpful if you are not using upvoting bots because if you do, one of them will likely be your Most Valuable Player. This is the case for my account here with @buildawhale, which is a bot I use frequently. 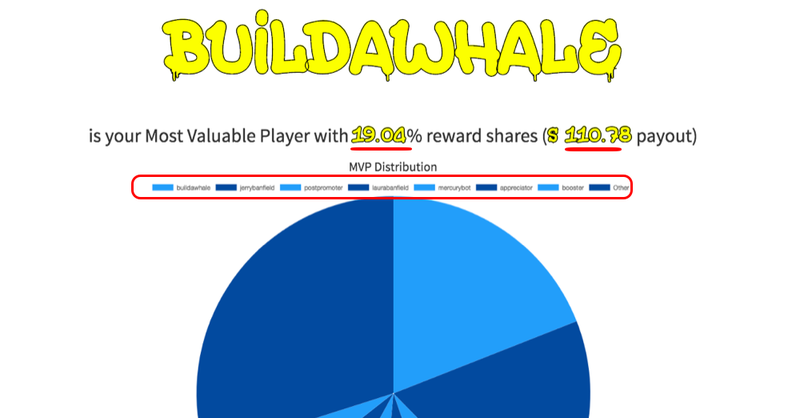 This is still useful to see a breakdown in this pie chart and the MVP distribution, which will show you other important players. Then, the website shows your Most Loyal Player and in this case, it's not a bot. On the 27 recent posts I have, @laurabanfield is my most loyal player because I received a vote for each post. This doesn't take into account the value of the votes, just that the user is voting consistently. Then, you have all the other voters and when you hover your mouse, you can see how many votes they placed. Having a closer look at this graph showed me loyal users I didn't know about. I think this graph is the best part of this tool because it is important to know who support you long-term regardless of the SBD value they give you. They are your fans. Finally, you have the "Raw Data" and this will show you all you need to know about for any of the users that have voted for you. 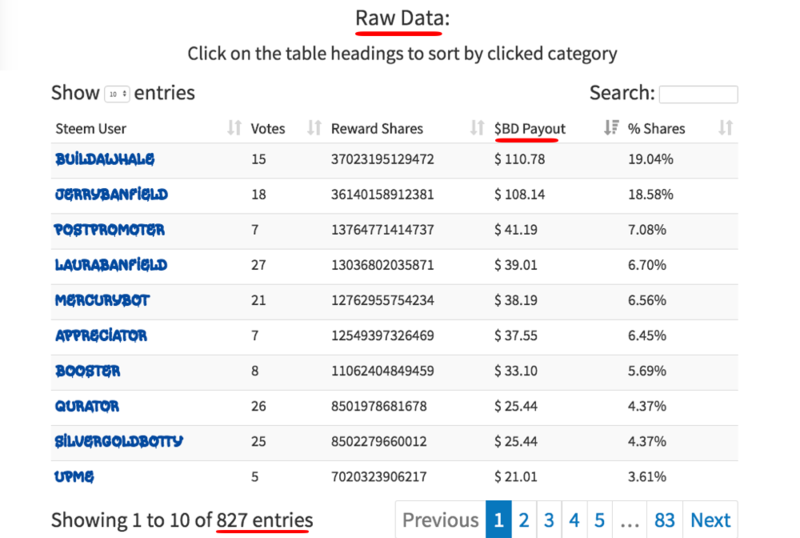 This is sorted by "SBD Payout" and you can see at a glance who are giving you the most rewards with their votes. You can also sort the results by Votes, Reward Shares and % Shares. The "Search" is also very handy, just type the first letter, the second letter, and like in Google, results will show instantly. As you can see, there are quite a lot of records to go through and this might be a good way to discover new authors and follow them back after clicking on their names and seeing their blogs. I hope that you will give this tool a try and that it is useful for you. Would you upvote this post and follow me for more because this will encourage me to write more Steem tool posts like this one? @uxchief you're on the @abusereports naughty list! Thank you @josephdarling for your comment and suggesting that the developer makes the app mobile friendly! very useful tool,like it dear. Thanks for spamming the comment section with not 1 but even 2 useless comments. Thank you @crypto-econom1st for commenting and noticing the comments. This comment has received a 0.15 % upvote from @speedvoter thanks to: @mahadihasanzim. Honored to be among your steemvp's Michel and I will resteem this soon! Very useful tool bro thanks for sharing it. Glad to hear this @imran-aslam. You did good job or the only best job for new Steemians. Every time I see your post I get something new to explore on steemit. Pretty cool and interesting tool. Nice to have an insight on the followers. Thank you @jessicapixie for your comment, I am glad you like my post. I am glad you like it, thank you for commenting. I am glad that you like my posts. Thank you very much. This is cool. So many wonderful apps making our life in the Steem space easy! That's right. We are lucky to have so many apps for the Steem blockchain. This is first time i heard about it. Never knew steem have this type of useful tools. Looks like, i have yet lot to learn. Thanks man. Good work. There are actually lots of these tools. I like steemworld. I see, i really know very little about these. Thank you for your comment @shuvomahfuz, I am glad it is useful for you. Thank you @michaelgodson for reading the post and commenting. Thank you so much @emmanueltare. That's a good one @crypto-econom1st! Thank you for putting some humor in this thread. Thank you @tanveerali, I am glad you like it. I am glad you find this tool useful, thank you for commenting @gpalav. You got a 1.28% upvote from @postpromoter courtesy of @gmichelbkk!